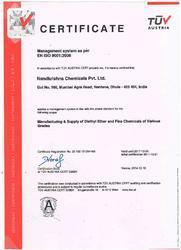 Since 1998, we “Nandkrishna Chemicals Pvt. Ltd.,” are well known for manufacturing and exporting Diethyl ether and specialty chemicals. Our product range bears accurate composition standards and is known for unmatched quality and purity as per the end specifications required by the customers. Over the years, our consistent production quality has helped us in attaining a leading position in field of chemical exports. The able guidance provided by top management our ethical business practices and sound process experience in this realm has further enabled us in upholding the market credibility. An environment conscious organization, we operate as per the safety measures defined in the factory act and pollution control government legislation. We also take pride in being the active member of Common Effluent Treatment Plant and are engaged in meeting the demands of rainwater harvesting & recharging and plantation with an eco-friendly approach. Our processes are backed by experienced lab scientists, who are well versed in this realm and efficiently work round the clock ensuring specified composition of the chemicals. Our base in Dhule (Maharashtra) also helps us in catering to the demands of our domestic customers. Besides, our global spanning network facilitates us in serving the global customers in a befitting manner. Our success in this industry has further assisted us in expanding our production activities domestically and internationally by developing flawless range of specialty laboratory reagents. Manufacturing and Trading of Industrial Chemicals. We offer a qualitative range of acid ethyl ether, organic industrial solvents, liquid ethyl ether, industrial solvents, liquid diethyl ether and specialty chemicals that are prepared from ethyl alcohol (denatured) & other chemicals. These are procured from distilleries of sugar factories and adhere to the IP & IS standards.